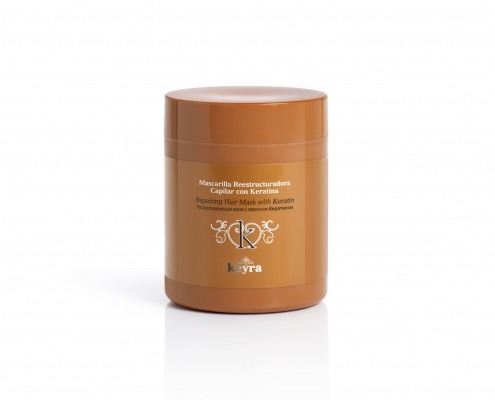 Immediate-acting mask that nourishes and moisturizes dry or very dry hair. Repairs cuticle damaged by technical procedures and thermal stress. Conditioner in 2 phases without rinsing, which moisturizes and restructures hair fiber. Aids styling and prevents frizz. Noticeably healthier and shinier hair. Visible results from the first application. Silver White Shampoo especially recommended for gray or white hair. Neutralizes the yellow brassiness in grey hair, restoring its natural whiteness and shine. Treatment shampoo that instantly combats damaged or dry hair. Formulated with Crystal Repair, a regenerative action complex and Hyaluronic Acid, which helps to strengthen the hair structure and repair hair from root to tip. Provides moisturization, nourishment, luminosity and silkiness. Keratin Liss Treatment Shampoo, formulated with Keratin and Flax Seeds, helps to restore, repair and strengthen hair fiber, making hair stronger and more bouncy. Nourishes and deep-moisturizes, restoring a healthy, flexible appearance. Makes hair shiny and soft, reduces frizzing and makes it easier to comb. Treatment shampoo that helps prevent hair loss. Formula enriched with Redensyl ®: Camellia extract, amino acids and zinc combat the aging process of hair follicles and hair loss. Also, has stimulating and toning properties that aid the recovery of the hair fiber and make hair thicker.